Enter a dark room, to be surrounded by flashing lights, moving shadows on the wall, silhouettes of men wearing Stetsons and taming bulls in a rodeo. The Stars and Stripes waves prominently. Projected through a thin triangle of three screens above a heap of desert sand, Wildcat (2016) is a confusing mess of images. 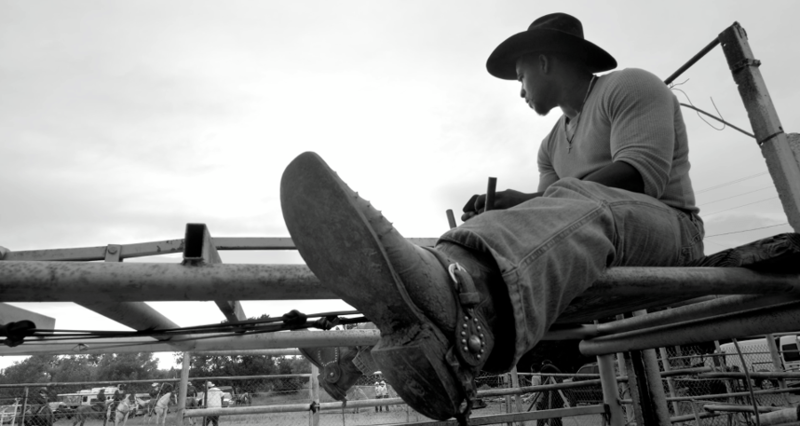 The rodeo setting may be familiar enough, if not for the African American people that join the event. In many ways, it is a characteristic film by Kahlil Joseph, whose first European solo exhibition New Suns at Bonnefantenmuseum (Maastricht, The Netherlands) will end this week. Wildcat is much more a mood piece than a factual recording of a little-known event. Shots are often in slow motion, slow pans without instantly recognizable purpose. More concentrating on details than aiming for an overview. Instrumental music dictates the flow of the film. Because of the triangular structure of the screens, images of the screens merge with each other. Images will even shine through the projection on the viewer, making them, in a way, part of the projected film. It is not so hard to see the influences of Joseph in this one film. Born in Seattle in 1981, he moved to Los Angeles to study film. There he became acquainted with Japanese cinema and the films of Tarkovsky. Starting as a personal assistant, he got to work for directors such as Terrence Malick and Sofia Coppola. His breakthrough came with the music video Until the Quiet Comes (2012). Soon afterward his approach to music videos proved difficult to match with celebrity culture. He came up with the idea of making Beyoncé’s Lemonade a visual project. However, his role in it was reduced by the introduction of a whole team of directors, supposedly because Joseph gave Beyoncé too modest a part in the video for Sorry (2016). Earlier, Kendrick Lamar decided not to use Kahlil’s video for m.A.A.d. (2014), which includes early home video footage of the artist. Struggling with the boundaries of cinema, he became influenced by the work of Apichatpong Weerasethakul. Next to his ‘regular’ films, the Thai director explores other formats of cinema. Museums offer the playground to neglect established ideas about length, narrative, and presentation of films, which appealed very much to Kahlil Joseph. Visitors of the exhibition in Bonnefantenmuseum, who have also seen last year’s exhibition of Weerasethakul in EYE (Amsterdam), will certainly find resemblances in the work of both directors. There is little narrative in both director’s films. They tend to create a visual flow, often using multiple screens. These different images somehow merge, triggering a stream of associations and resulting in a sometimes dreamlike sphere. This is especially the case with m.A.A.d, a two-screen projection of life in Compton, California. The camera registers, often in slow motion, details, such as the tattoos of the inhabitants. The images on both screens sometimes are in sync, only to continue in separate ways after a short while, to eventually ‘meet’ again. Visuals of contemporary life in Compton are mixed with 90’s home video footage of Lamar, and a few images that seem to come from another world, for instance, a man on a horse cruising through nightly Compton. Through its presentation, Wildcat includes the viewer in its story. The viewer literally has to choose an angle to perceive the remarkable event that is shown, while the images are projected on themselves as well. At Wizard of the Upper Amazon (2016), the screening room is designed almost exactly as the room in the projected film; a lot of folding chairs against the wall, and in the middle of the room a table with the remains of the pot smoking we see on the screens. The film consists of little more than Rastafari smoking marihuana. It is filmed and cut in a way that resembles the experience of being stoned. All the time, we see one empty chair in the middle of the row, an invitation to ‘join’ the experience. It is, again, a presentation of a subculture that invites you to become part of it. It is the epigram of a novel by the science fiction writer Octavia Butler. The epigram shows an optimism, the possibility to come to a new understanding of things we may too easily have misjudged. It is at least what may be experienced at New Suns.